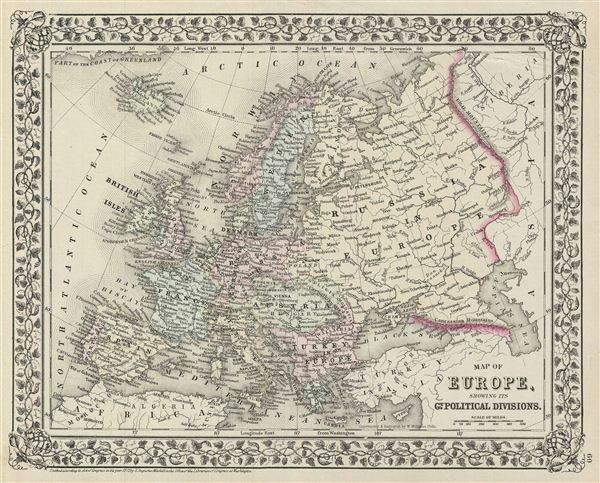 A beautiful example of the American map publisher Samuel Augustus Mitchell Jr.'s 1872 map of europe. Depicts all of europe including Iceland. The map incorporates both political and geographical details. Of note is Mitchell's inclusion of the legendary and semi-mythical whirlpool known as the Lofoten Maelstrom (Maelstrom) in northwestern Norway. This legendary whirlpool was the inspiration for edgar Allen Poe's classic tale 'Descent into the Maelstrom.' In reality, it is a periodic and powerful current caused by tidal variations in the region. This map depicts a period shortly following the unification of Italy and the rise of the British empire apex of power and influence. It was also a time of decline for the Ottoman empire. This map follows the period immediately after the Franco-Prussian War and the unification of Germany.